Keep your surgical department running like clockwork. MEDITECH Expanse Surgical Services helps staff to strengthen efficiency and coordination, opening the doors to safer, more productive operating rooms. Intuitive and comprehensive tools — enhanced in MEDITECH Expanse Surgical Services — enable your staff to manage workflows and patient care more precisely for increased revenue. 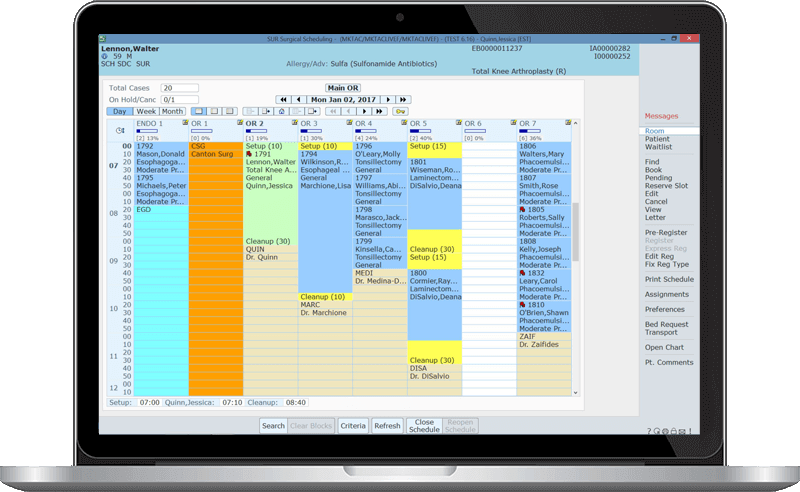 Scheduler Desktop: Schedule cases and use options for customization and enhanced flexibility. Preference Card Management: Your OR, your preferences. Organize and modify your preference cards, complete with images, at any time. Inventory Control: Monitor inventory use and availability throughout your organization. Automatic charge capture brings expenses directly to the patient’s account. HIPAA-Compliant Surgical Trackers: Enter, edit, and monitor all perioperative information associated with a patient, in real time. Data entered through the tracker is accessible to all providers associated with that patient. 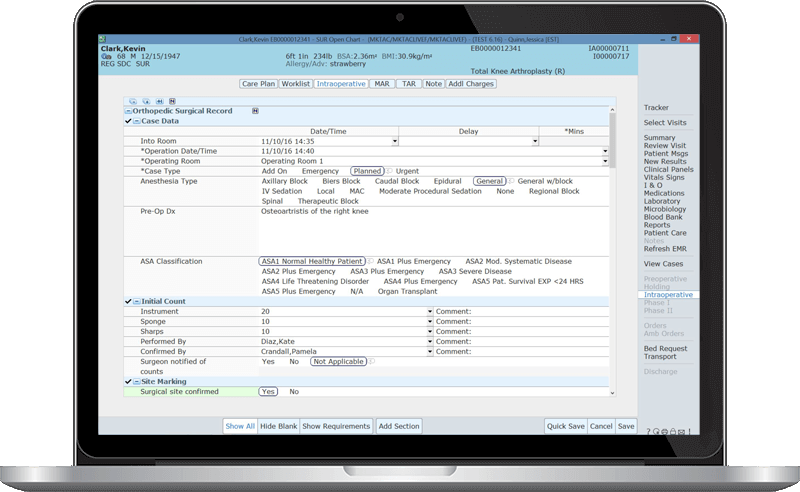 Case Record Documentation: Document the entire perioperative episode; information flows directly to the patient’s electronic record in real time. Share critical patient information with other-vendor Anesthesia Information Management Systems. Director/Manager Desktop: Executives make more informed decisions when they use this desktop to generate specific data, break down statistics, perform cost analyses, and review block utilization. Along with the value of saved time and efficiency, Materials Management ensures that we not only have the appropriate supplies for each specific surgery, but that the billing and reordering for those items are done smoothly within the IntraOp documentation section. Ramp up efficiency with fast and flexible scheduling. Instantly book, move, cancel, hold, and reschedule cases. Make it your own with customization. Tailor desktops for multi-resource scheduling, complete with enterprise-wide resource conflict checking. Choose from horizontal, vertical, or bird’s-eye views of the day’s cases. Automatically link preference cards to scheduled procedures, and view scheduler’s notes directly from the schedule. Need to move a surgery from one room to another? Just drag and drop it. We were looking for a solution that supported our team’s collaborative style, and MEDITECH’s Surgical Services has done just that. Their comprehensive approach to scheduling, documentation, and tracking has helped to bridge all the moving parts of our operating room. Document the entire perioperative episode, from Pre-Op to PACU. Easily record operative text, surgical outcomes, staff present, and surgical times. Safely administer medications and blood products using the embedded eMAR and Transfusion Administration Record. 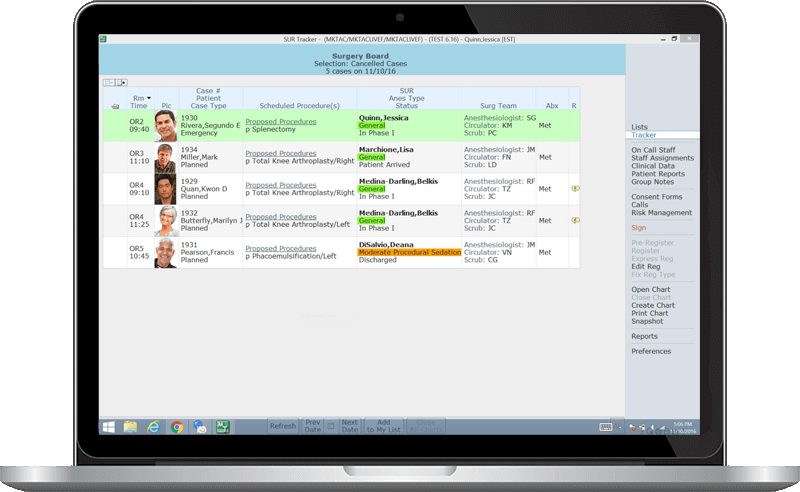 Manage both Pre-Op and Post-Op follow-up calls and assessments with system-generated worklists. Document multidisciplinary care plans right from the surgical record, where they flow from department to department, and directly to the patient’s electronic record. The standard content statistics reporting within the Surgical Services is the envy of other nursing departments. Full integration with our Materials Management solution means you know your inventory levels and usage at all times. Inventory levels are automatically decremented in real time as supplies are used in the surgical case, and a queued orders feature will allow for a streamlined ordering process for physicians. Plus, automatic charge capture sends materials-related charges directly to patient accounting, increasing revenue. Pinpoint changes to inventory when items are lent to, or borrowed from, another location. Track patients throughout the surgical setting. Stay up to the minute on surgical activity with HIPAA-compliant trackers. One look tells you when cases are on time, delayed, or cancelled. SCIP and quality metrics can be monitored in real time for improved patient outcomes. You can even build a tracker for loved ones in the waiting area, using custom patient identifiers for maximum confidentiality. Learn how MEDITECH Expanse Surgical Services empowers your organization to better manage surgery workflows and patient care.